Video production is inherently a team effort (production requires a director, camera person, actors, an editor, etc.) and therefore creates an opportunity for learning in a social context, which has been shown to lead to better learning outcomes in climate change education. Video production also promotes the basic tenets of engagement theory, in which students work in small collaborative teams on projects that have an authentic outside focus. 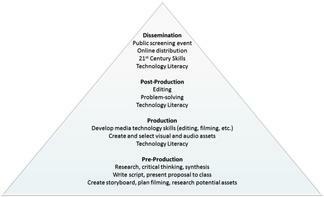 We have found the CAM approach of integrating media production into climate change education to be very effective at the high school, undergraduate, and graduate student levels. The CAM project offered two workshops (same content/different dates and locations) for secondary and post-secondary educators during the summer of 2013, to help educators integrate student-created media into their classes. As a method of disseminating student media production as a teaching method, educators and professional development offices are encouraged to use these resources to run workshops in their local area. The resources include powerpoint presentations, video and audio recordings of project PIs presenting them, as well as handouts and other printed materials.